This dish is a family favorite and one that I grew up having. I remember asking for this once when we were visiting my great grandmother in Santa Maria during my birthday. My sweet mom and grandmother made it for me. It was obviously a good day because I still remember it years later. It's the one my husband requests for our anniversary or his birthday or anytime I ask him what he wants for dinner. If (and I mean if) you have any leftover chicken it is perfect for a salad. Dinner and lunch the next day is good by me. Note: I cut our chicken breasts in half to make 8 portions. This helps the meat go a lot further and helps us from over eating. It's a great trick for portion control and is a lot easier to do before hand. Can I just say that I grew up in a great food environment, I mean really great. We had lots of different styles of food and my parents both made some awesome dishes that were family favorites. 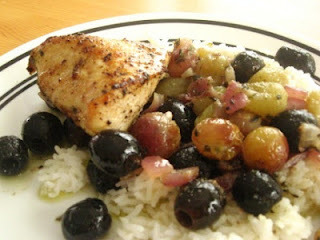 This is another one of those recipes that I grew up with that my hubby now asks for often. It's absolutely delicious and I think tastes better the next day making it perfect to make ahead. Make the BBQ chicken for dinner the night before, making some extra to throw in this pasta salad. Add salad ingredients into a large bowl. Combine dressing ingredients in a bowl and whisk until well combined. 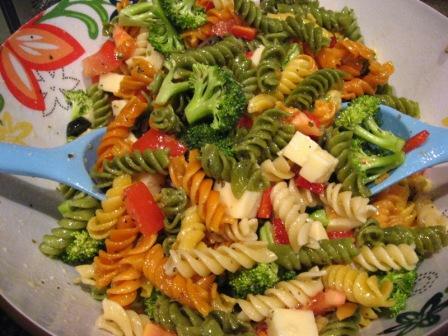 Pour over pasta salad and toss to coat. Refrigerate until ready to serve. Living here in the south has been quite the adventure for our little family. Perhaps my favorite store here has been Publix. I subscribed to one of their magazines and quickly fell in love with their recipes. Lots of delicious looking and sounding meals, healthy alternatives to favorite foods, definitely my kind of store! This recipe is awesome and was a fast favorite for my little ones. They get excited because they are eating doughnuts and I am excited because they are getting something much healthier. 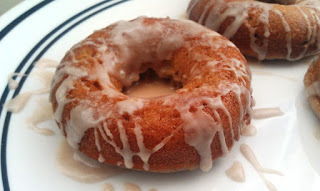 My husband likes these but dislikes them being called a doughnut. He calls them muffins in a doughnut pan. Oh well, you can't win every battle but it doesn't stop him from eating them. Spoon batter into a ziploc bag and snip off the corner, the hole should be about 1/2 inch. Pipe into a doughnut pan. Cover pan lightly with plastic wrap. Refrigerate for 1 hour. Bake for 13 to 15 minutes, or until lightly golden brown and doughnuts spring back when pressed gently with your finger. Cool doughnuts in pan on a wire rack for 5 minutes. Carefully invert pan to remove doughnuts. Combine ingredients in a small bowl. Add additional apple juice if needed to reach a drizzling consistency. Note: If you want to make these as muffins, spray a 6-cup muffin pan with nonstick cooking spray and bake as directed.